Cannot be Normal Summoned/Set. Must be Special Summoned (from your hand) by having exactly 5 WIND monsters in your GY. If this card is Special Summoned: Destroy all Spells and Traps your opponent controls. 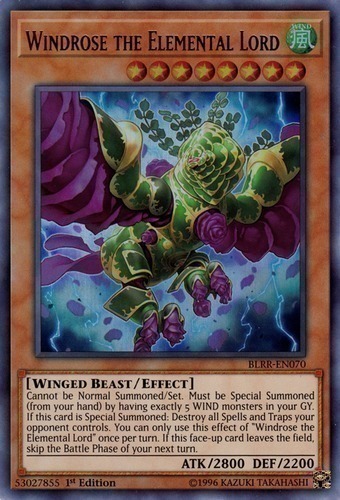 You can only use this effect of "Windrose the Elemental Lord" once per turn. If this face-up card leaves the field, skip the Battle Phase of your next turn.